Please contact the Office of Admissions at (301) 739-4266 ext. 132 to request a visit and tour of the school, or ask questions in general. Applications are recommended to be received by February 1st; however, Goretti offers a rolling admissions throughout the year. .
A completed Application must be accompanied by: a $150.00 non-refundable fee; letter of recommendation forms from the Math and Language Arts teachers; copies of transcripts, including a copy of the student’s most recent report card and a copy of the student’s year-end report cards for the prior two years; and copies of any standardized testing the student has had in the past three years. Goretti accepts applications for enrollment on a year-round, rolling basis. Typically, applications are requested by February 1 for first-round decisions. Applications are considered complete when all required documentation has been submitted. Prospective students completing the interview process by February 14 will be eligible for first-round priority acceptance. After this date, a rolling admissions process follows until the class is filled. Students who do not attend a school in the Archdiocese of Baltimore should submit the Math and Language Arts Recommendation Forms (one recommendation for math, one recommendation for language arts) to their current school. These forms are given to the prospective teachers by the student/parent and upon completion are sent directly to the Admissions Office either by email at hkatrina@goretti.org or by mail c/o Holly Katrina, Admissions. The application requires a copy of the student’s current report card and a copy of year-end report cards for the prior two years that may be uploaded. For example, a student currently in 8th grade would need to provide a copy of the most current report card and a copy of the year-end report cards for 6th & 7th grade. Please provide copies of any standardized testing the student has had in the past three years. 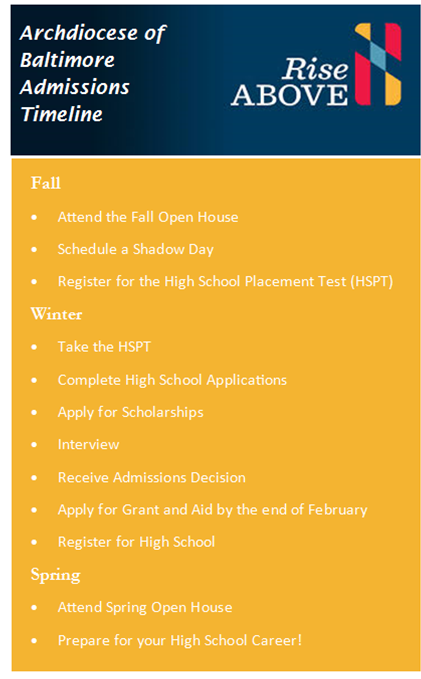 All incoming freshmen are required to take the High School Placement Test. St. Maria Goretti High School offers the test on campus in December. There is a scholarship awarded to the boy and girl who score the highest on the December placement test. Students who miss the December test may contact the admissions office to schedule a date to take the test individually. Placement test results are also accepted if taken at another Archdiocesan school. Visiting the Goretti campus is an ideal way for students and parents to observe the atmosphere of the school. Visits are scheduled with the Director of Admissions. Those with special interests are encouraged to meet with specific program directors and coaches. Please notify the Director of Admissions in advance if you would like help in arranging these visits. An interview with the student and parent takes place after the completed application is received by the Admission Office. After the interview, the Admission Committee evaluates each applicant, and a letter of notification is sent to the prospective student. The Admissions Committee will evaluate each student. Upon completion of this review, the student will be notified of the Admissions Committee’s decision. First-round notifications will be mailed February 14th, 2018. Applications received after February 1 will be evaluated and acted upon individually on a rolling basis once the application process is complete. Students may be offered a place on the “wait list” if space is unavailable at the time of acceptance. If you require financial assistance, please indicate on your application.